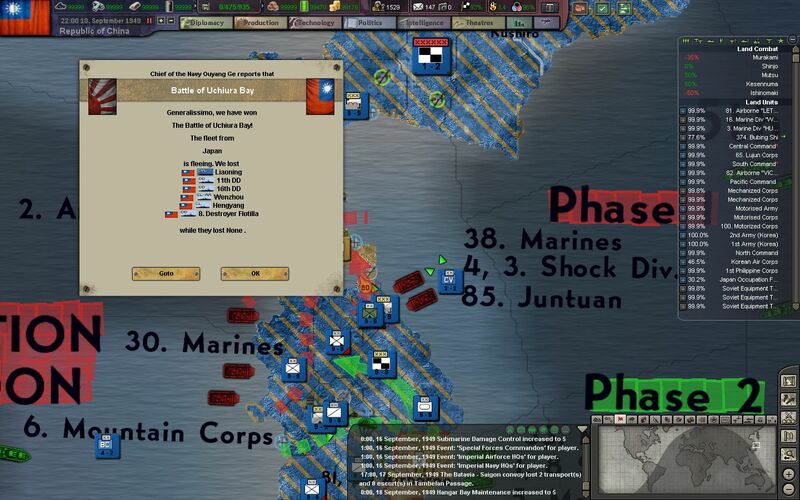 Hey all, and thanks for reading Episode 20 of my Republic of China AAR in BlackICE 8.6. If you missed the previous episodes, they are linked below. 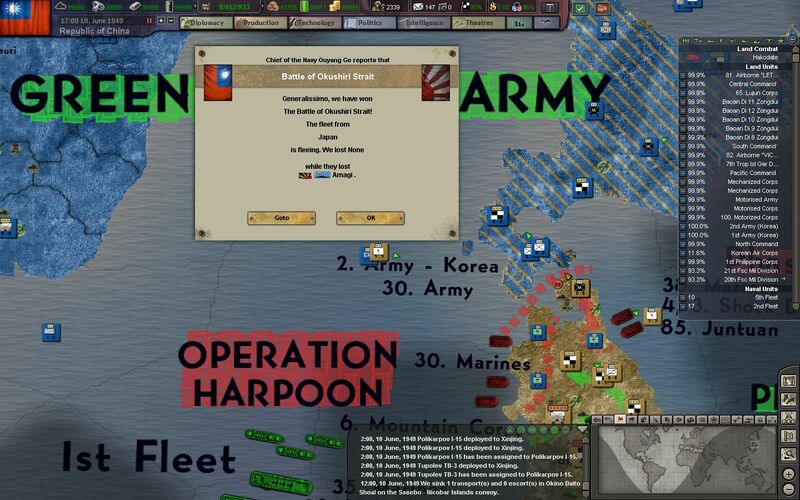 Last episode left off with the capture of the northern home island of Hokkaido, and the preparations for the invasion of the main island of Honshu. 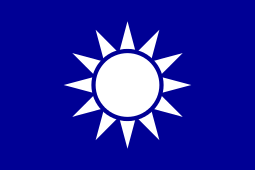 Almost 750,000 men of the IJA and Kokumin Giyo Sentotai (Home Guard) are stationed across the Tsugaru Strait. 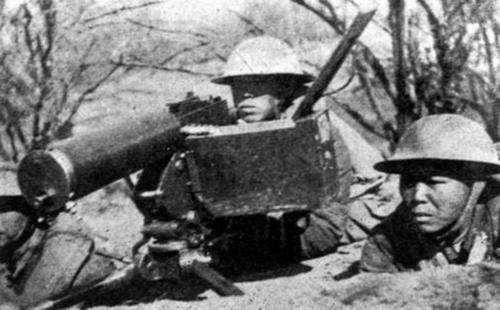 Our men on the opposite site, at Hakodate, are being constantly bombarded by Japanese artillery, and face daily attacks from men attempting to cross the strait. 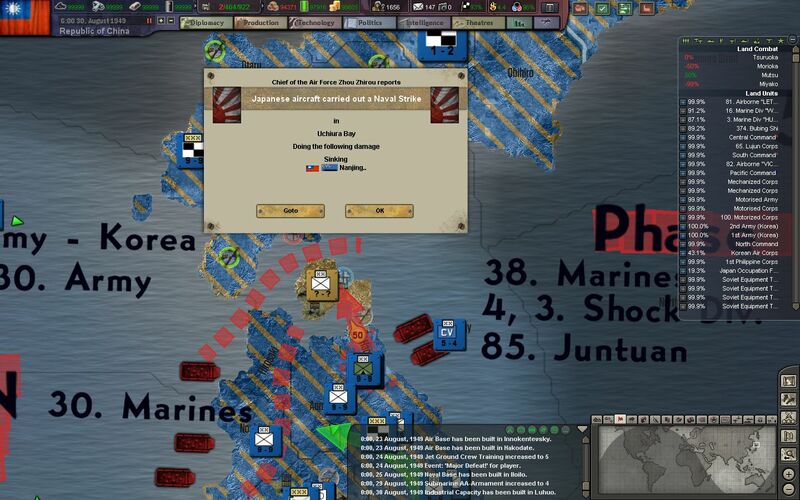 The bulk of the Japanese fleet is holed up at the port at Mutsu, and only launch occasional sorties - most of which are swiftly put down by our carrier air groups. Our admirals guess that the last remnants of the IJN are waiting until our invasion to launch all out attacks on our landing craft. 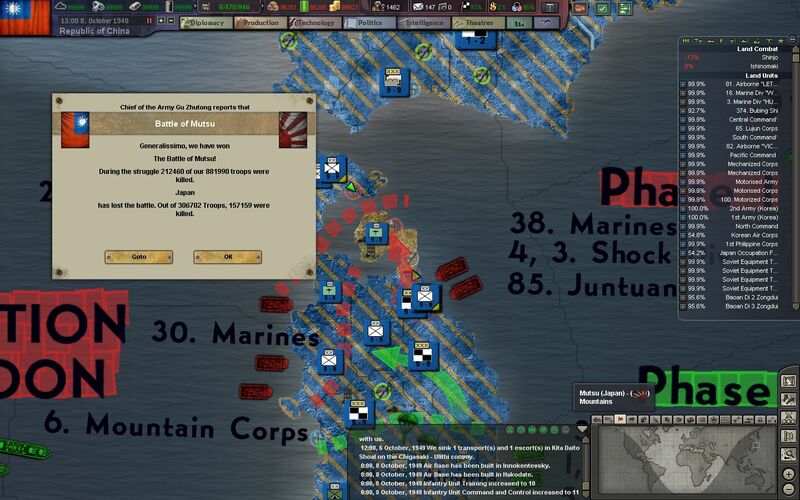 We must be careful to maintain a heavy naval presence in the area, even if we are at risk of losing our cruisers and destroyers to kamikaze attacks. 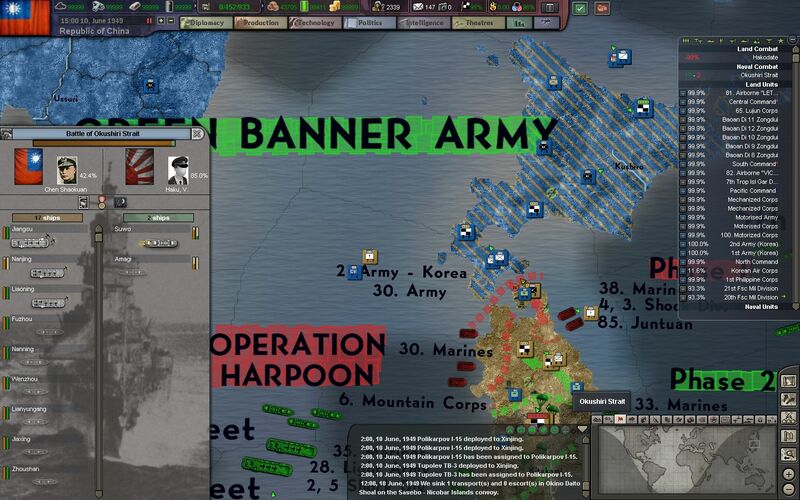 The next phase of Operation Warhammer is drafted - Operation Harpoon. 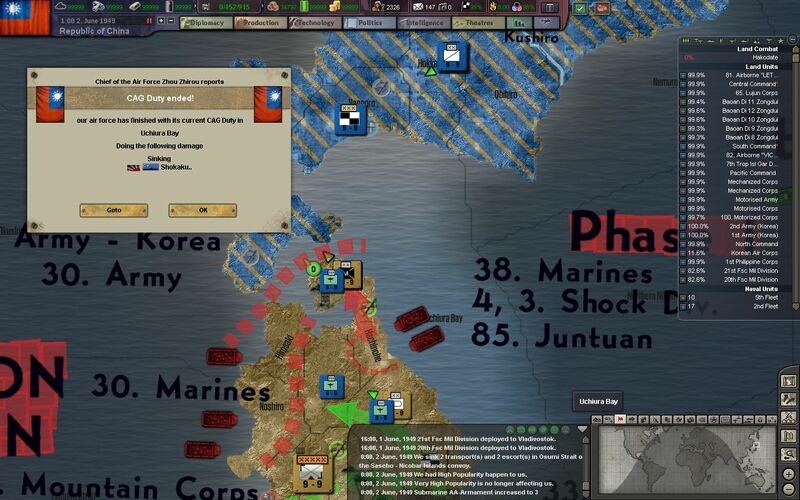 The operation is divided into two phases - the 1st focuses on the capture of the ports of Mutsu and Akita in order to sustain our forces in northern Honshu, while the second involves secondary landings and a crawl down the island. 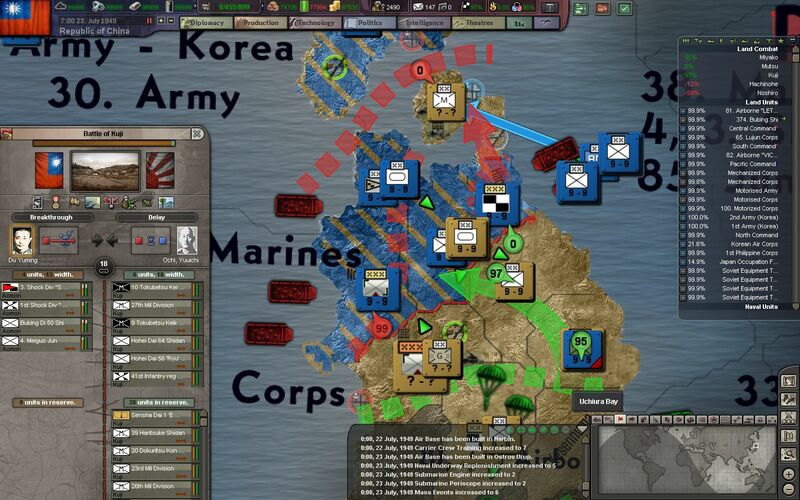 The 2nd Carrier Fleet is deployed in the area to attract the IJN and soften up their fleet. 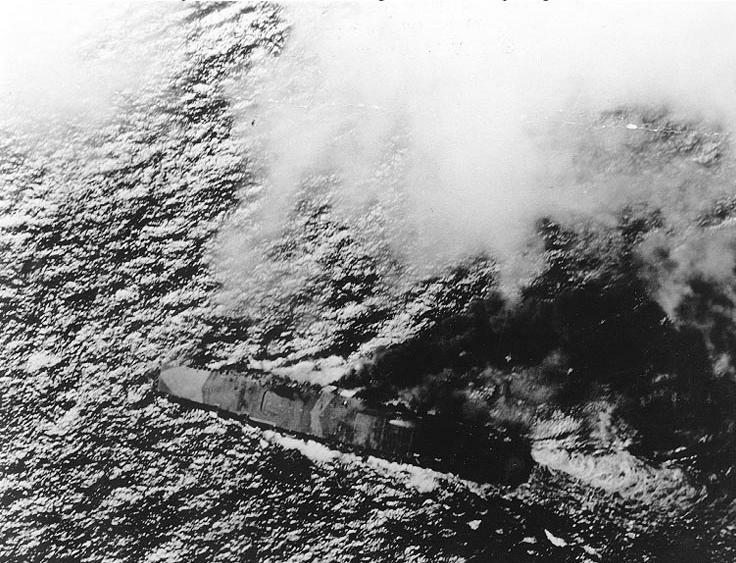 ...while our carrier air groups sink the carrier IJN Unryu and the battleship IJN Tango. 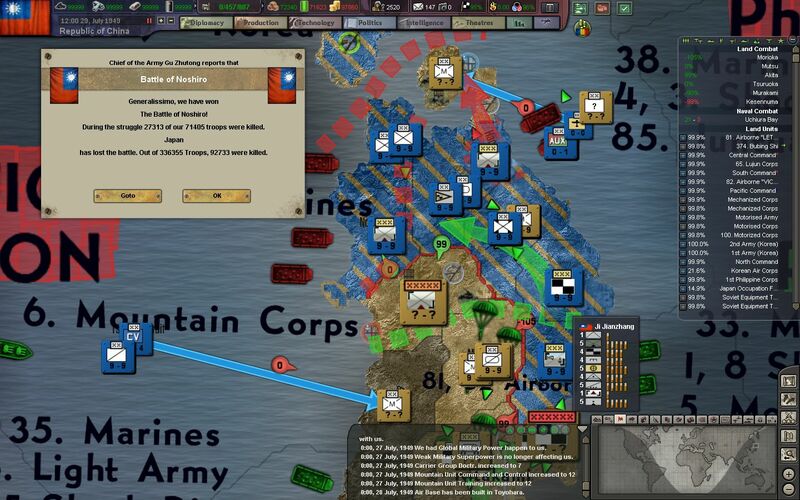 And a few days later the 2nd Fleet scores another glut of kills on the IJN. 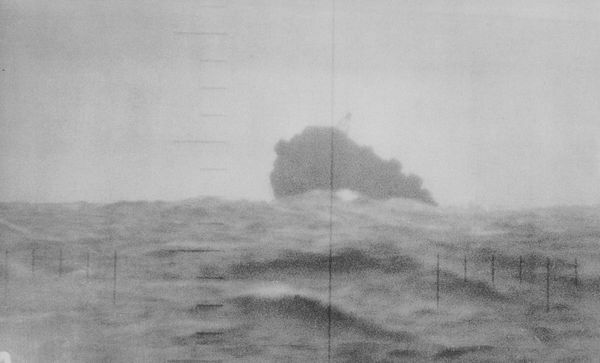 The IJN Zuikaku, IJN Kaga, and heavy cruiser IJN Owari are sunk to the bottom of Uichira Bay. 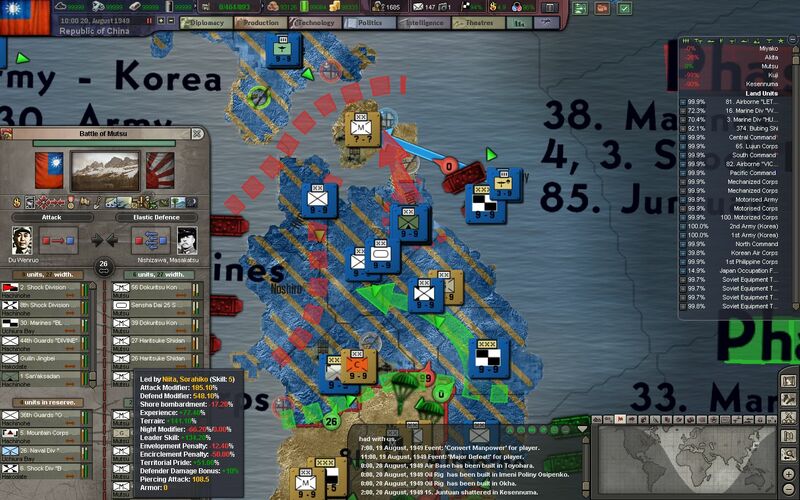 The IJN now have only a handful of capital ships left. 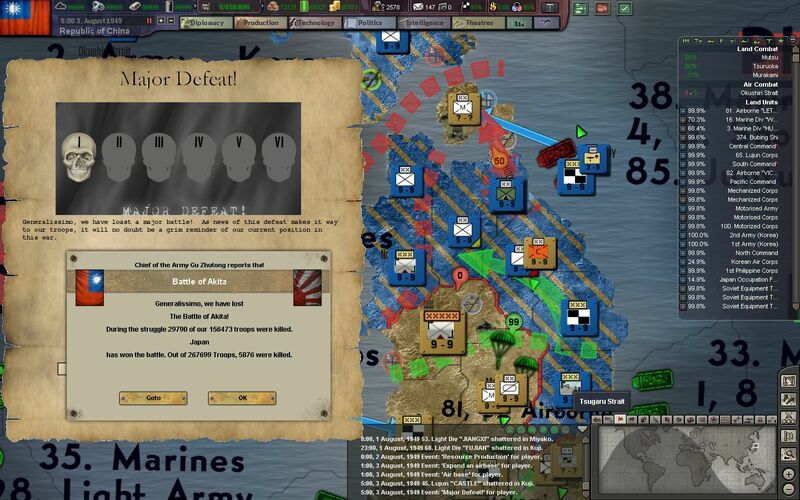 Unfortunately the 2nd Fleet is taking heavy damage from kamikaze attacks from the mainland, and will need to be pulled out soon for rest and repairs. The Ise scores hits on the ROCN Sanya, and the IJN Musashi is able to sink some of our destroyers before heading back into port. 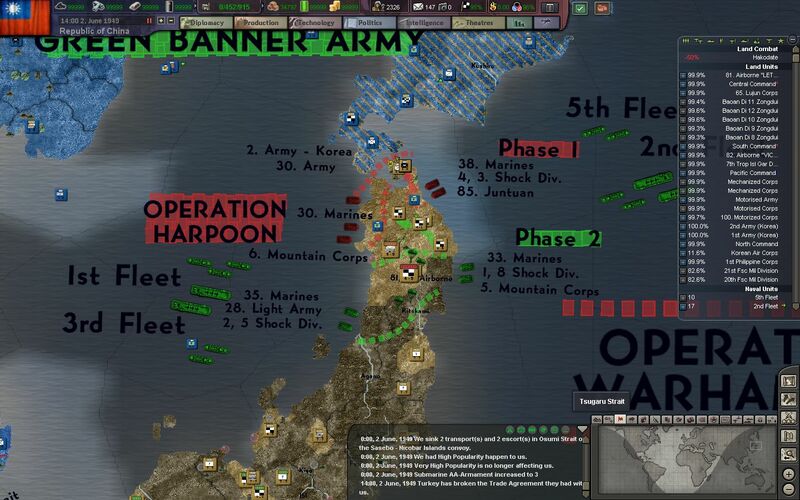 Operation Harpoon is commenced on the 10th of July, with the 6. 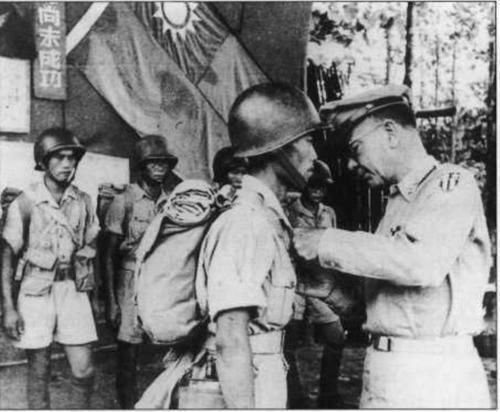 Mountain Corps - veterans of the anti-communist campaign at Yan'an and the campaign in Indochina - landing 150 kilometers south of Mutsu, in the mountains of Noshiro. The are able to establish a considerable beachhead before encountering any real resistance. 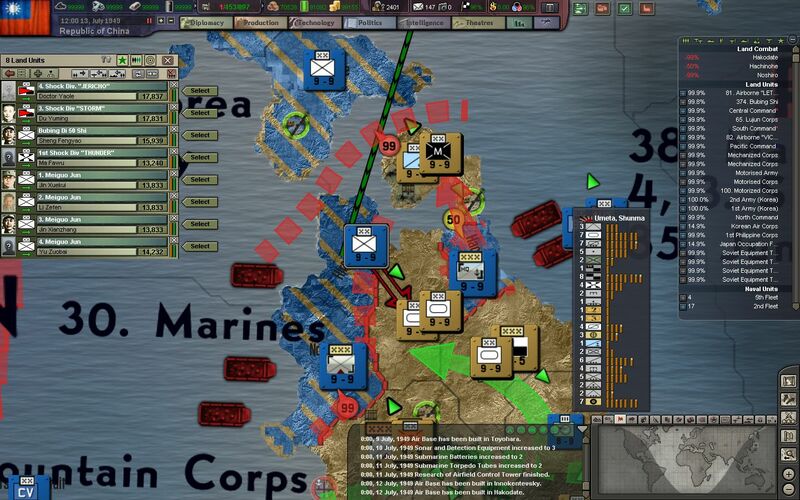 Their orders are to draw in as many of the IJA defenders as possible - to buy time for our future landings. 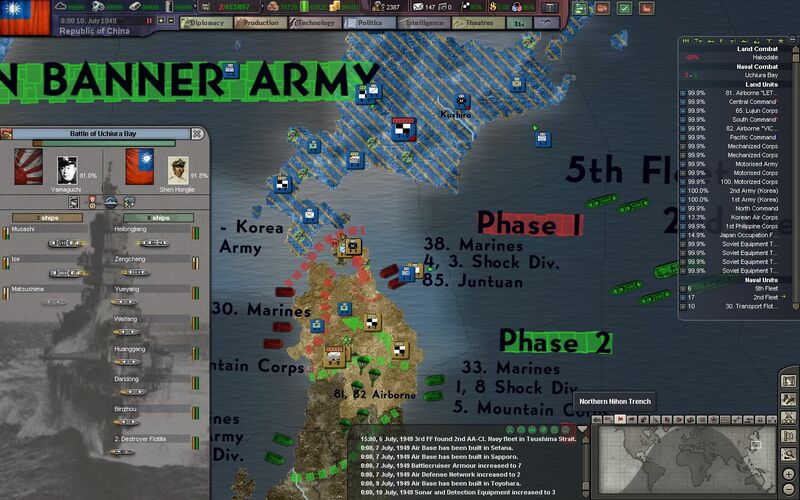 Next, a mixed force of NRA infantry, and Korean infantry and mountain troops lands at Hachinole - cutting off the defenders at Mutsu and surrounding the port. 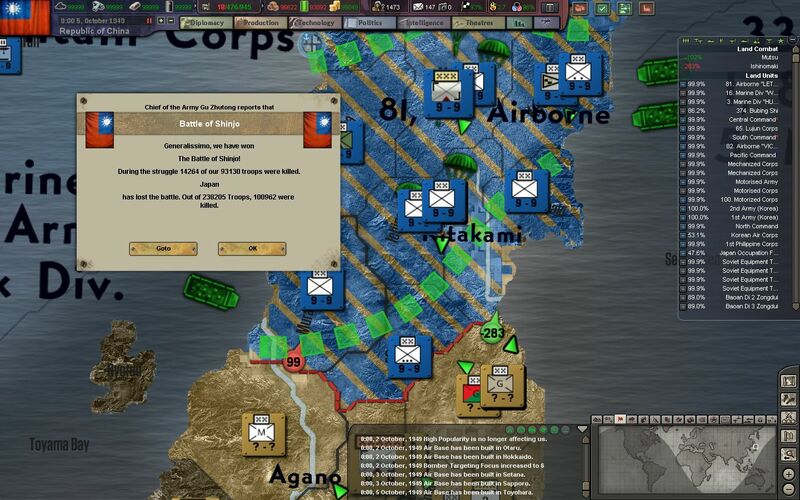 Another corps of shock troops and battle-hardened veterans is landed at Hirosaki, to try to punch through Aomori and establish a connection with our troops at Hachinole. Our shock divisions continue to impress our commanders, and they are frequently the first unit sent into combat when the odds are completely against the NRA. From Kuala Lumpur, to Hokkaido, they are given the hardest tasks, but also the greatest honor. The 33. 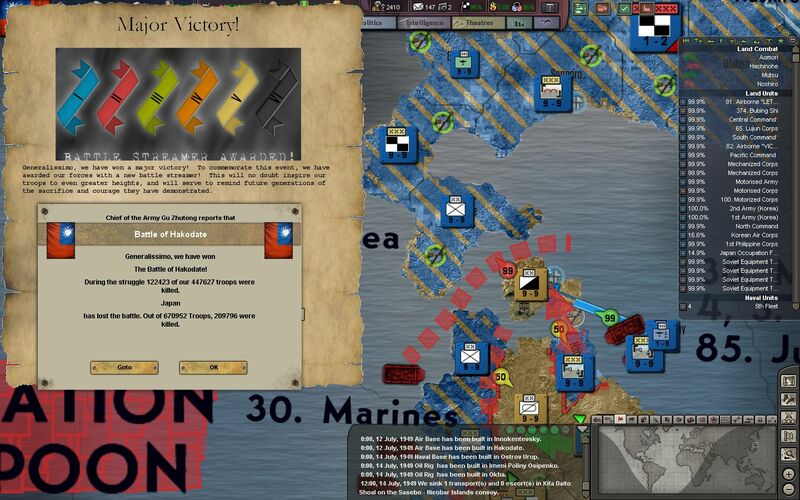 Marine Corps launches an invasion of Mutsu from its eastern coast in an attempt to speed up its capture. The battle will most likely not be won for many weeks, however. 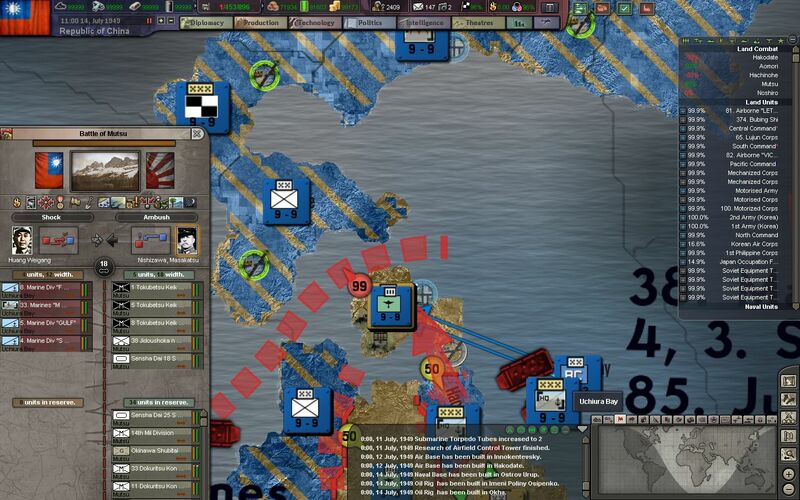 There are over 500,000 men still defending the port, and they have enough supplies to last for months. Nearly every civilian in the city has been given a war duty - either on the front lines, or making ammo for those who are fighting. 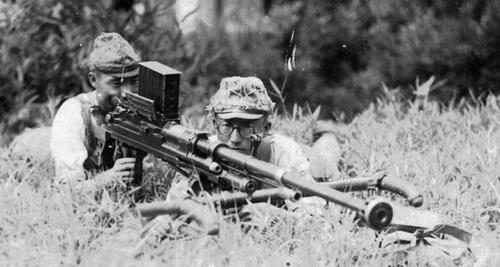 Nearly half of the troops the NRA faces are not even that - they are old men, children, and women pressed into service by the zealous Japanese. 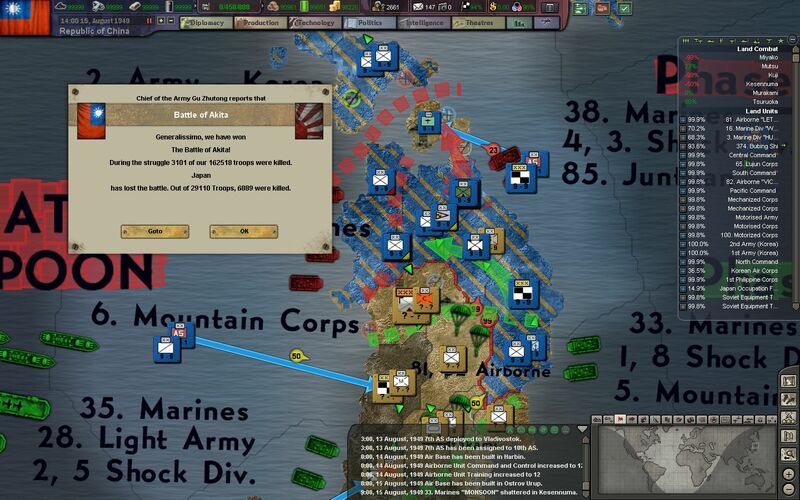 The recent attacks on Mutsu have prompted the IJA to stop their offensive operations at Hakodate and dig in at Mutsu. With the smoke cleared - the casualties on the strait are horrendous. 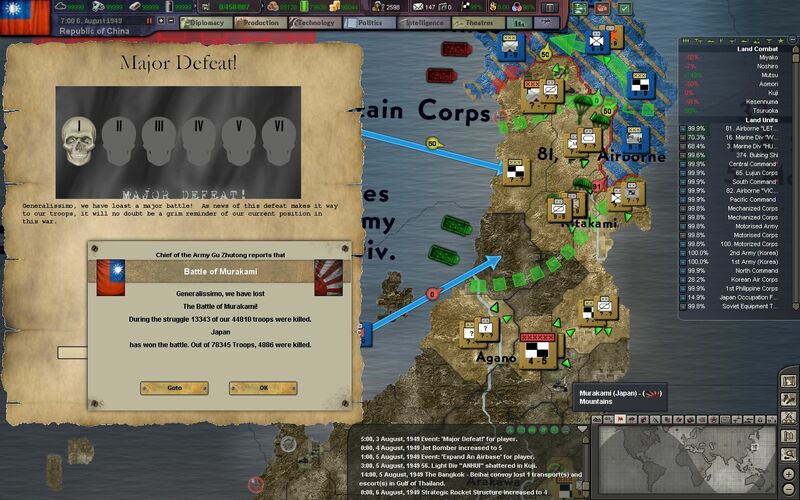 Over 100,000 troops of the NRA, and 200,000 troops of the IJA and Home Guard have perished for a fruitless back and forth battle across the Tsugaru Strait. 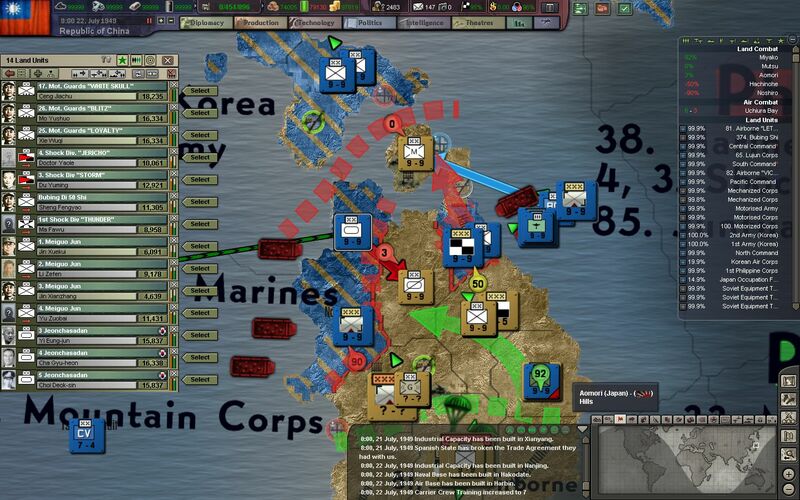 Our CAS aircraft score many kills on the defenders and their positions, but are chewed up by extensive AA network and a swarm of interceptors defending Honshu. Their use will have to be limited and precise from now on. 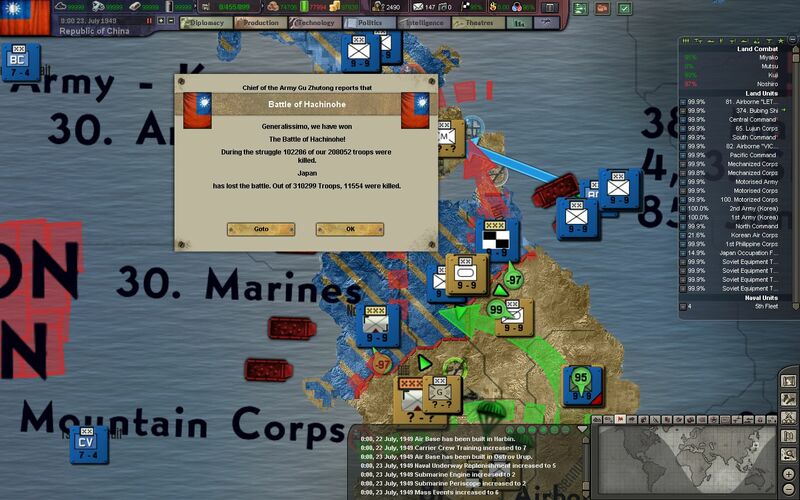 Our troops at Hachinole begin to break from the pressure - from over 250,000 troops assaulting the position from the south. 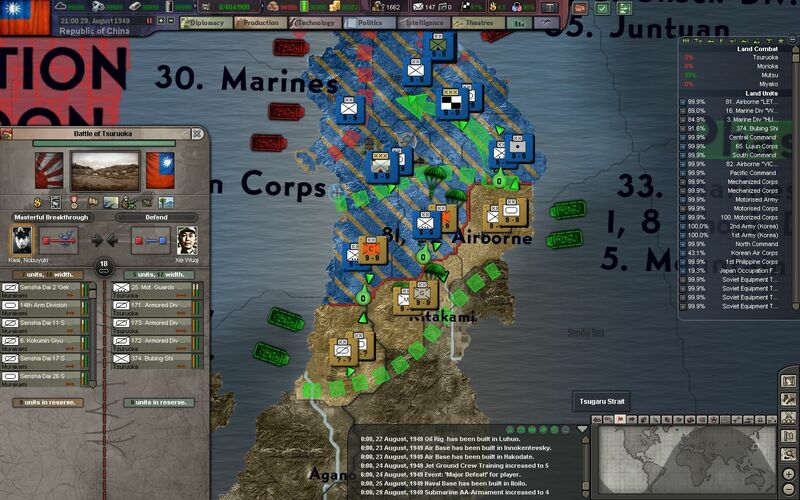 More infantry is landed in the province to help hold this crucial position. The 801. Airborne Division is dropped 100km south of Hachinole to distract reinforcements heading North. They are also tasked with disrupting the military communications of headquarter units stationed in the area. The 3. and 4. 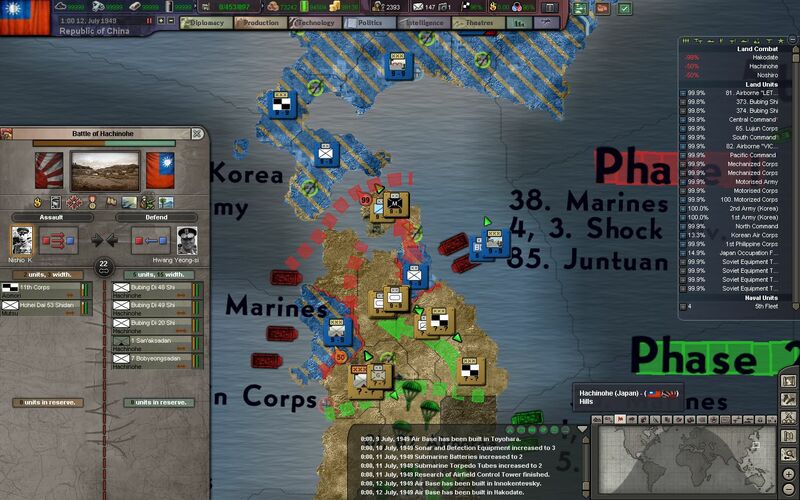 Shock Divisions finally break through the defenses at Aomori, and succeed at uniting the western and eastern coasts of northern Honshu. The 1. and 3. Shock Divisions immediately push on towards Kuji, to try and relieve the pressure on Hachinole. The diversionary attack works, and the trench lines at Hachinole finally fall silent. The risky landing cost the lives of over 100,000 men - who suffered their heaviest casualties from Japanese artillery while they were trapped in the open. 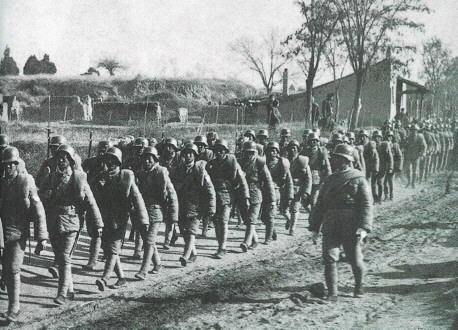 These men now get a well-deserved breather as the Japanese forces to the south are forced into the defensive. The 801. Airborne clears out Miyako, while the 33. 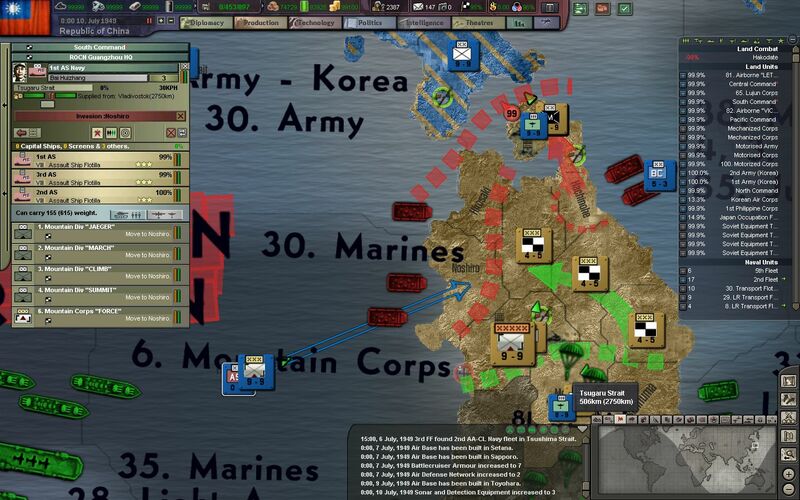 Marine Corps lands at Kesennuma. At the same time, the 35. 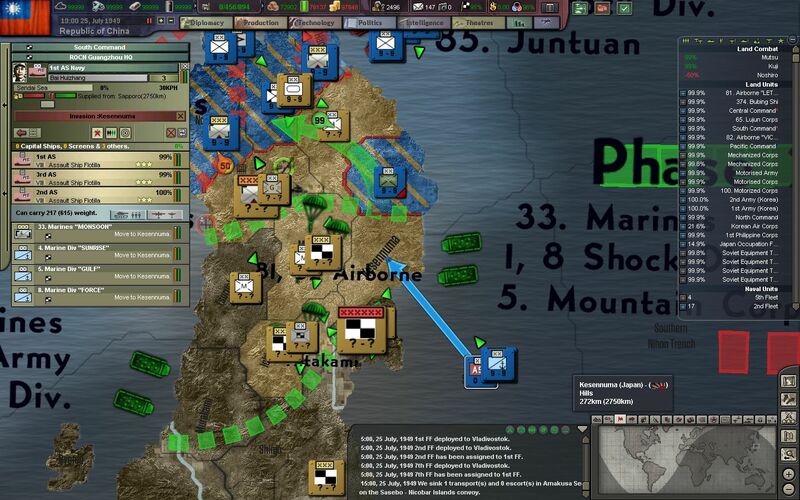 Marine Corps attempts a landing on the mountainous coast of Murakami - which seems to be only lightly defended by a garrison force. 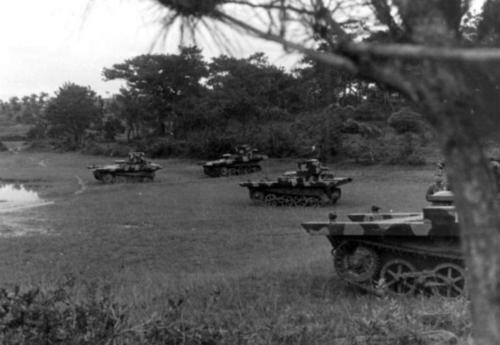 After some brief rest at Aomori, our motorized and armored divisions make a push for Akita. Although these vehicles and tanks of these divisions fare poorly in the mountain passes, many of the Japanese defenders only have outdated anti-tank rifles and grenades at their disposal - and have an extremely hard time penetrating the armor of our tanks and APCs. The 6. 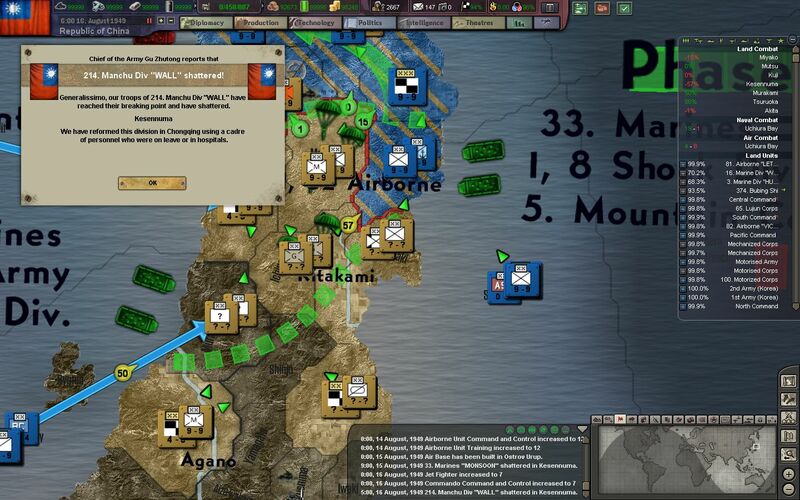 Mountain Corps, fighting for nearly two weeks against 100,000 men from Akita, pushes the attackers back and joins the fight for the crucial port city. More of our cruisers are baited into combat by Japanese battleships, and then quickly sunk with hordes of Kamikaze planes. 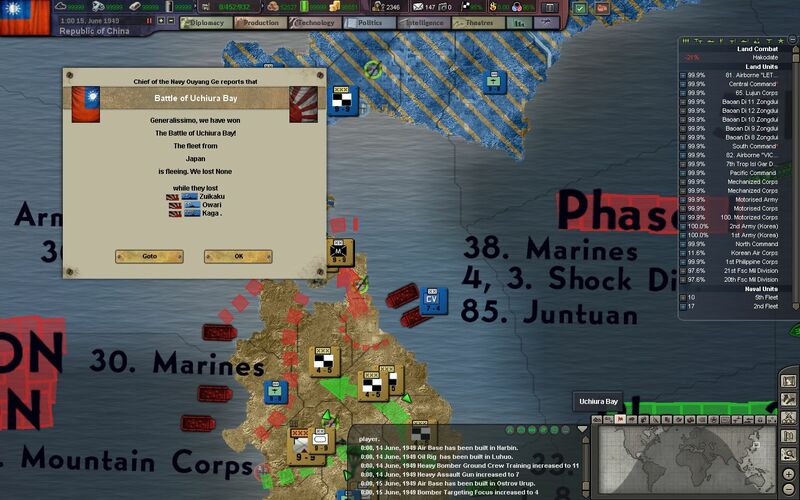 Our fleets are successfully keeping the IJN bottled up in Mutsu, but this attrition is certainly unsustainable. 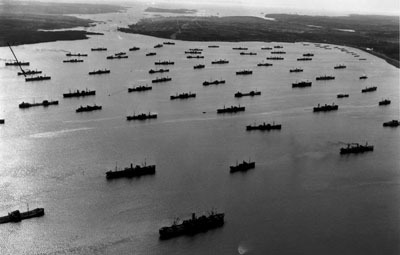 The 2nd Fleet is sent to relieve the 3rd Fleet, after a brief period of rest and repair. 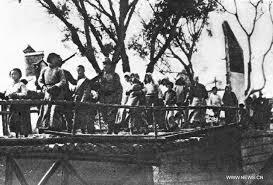 The 1st assault on Akita is called off, as more reinforcements from Hokkaido are landed in the staging areas south of Mutsu. 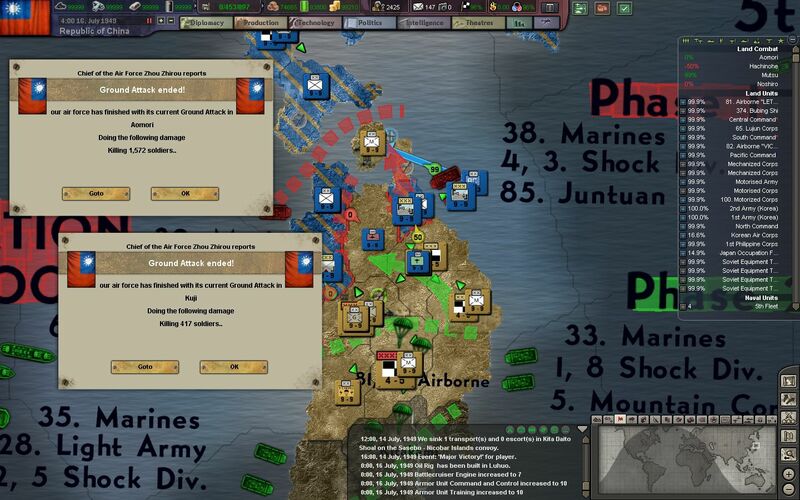 The mountainous terrain of northern Honshu is tearing our infantry troops apart, and our mountain and shock divisions frequently have to be called up to take the burden. The 35. Marine Corps calls off its landing at Murakami, after it is reinforced by another 4 regular infantry divisions from the IJA. Our demoralized marines retreat back onto their assault ships and are recalled back to Hokkaido for resting and refitting. 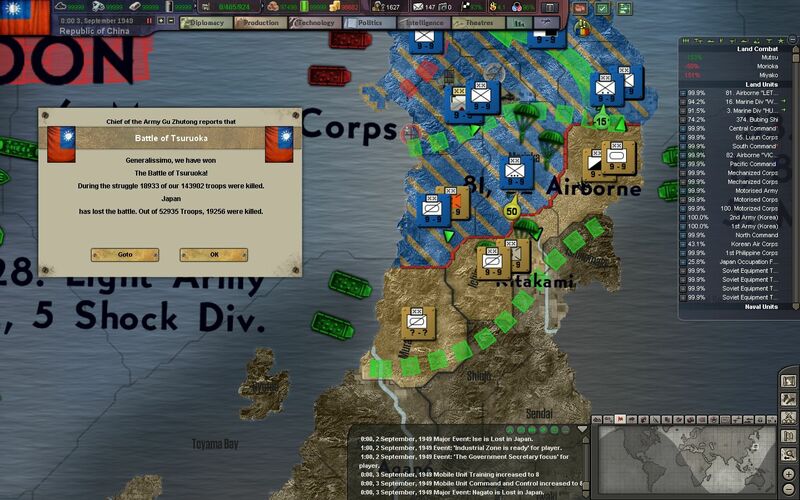 A diversionary landing south of Akita has stemmed reinforcements to the city, which is now defended only by the Home Guard - who do not put up much of a fight against our armor and elite mountain troops. 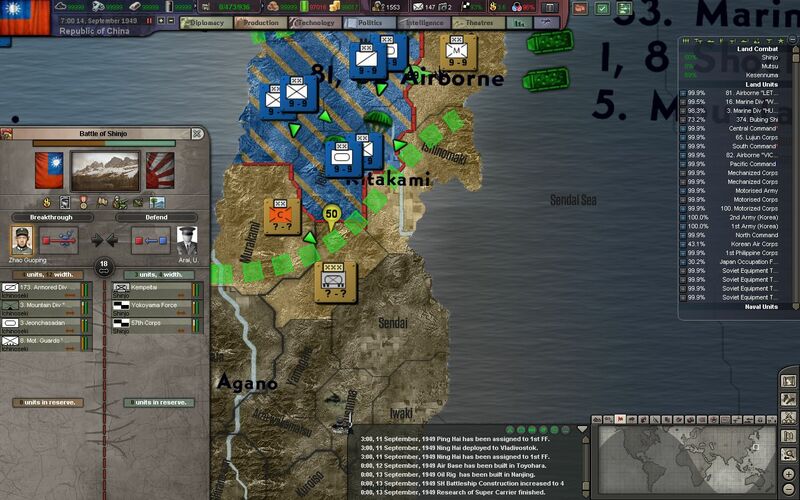 Our defenses at Miyako are holding strong, but the troops on the exposed plains of Kesennuma are being chewed up by artillery and assaults from IJA shock troops from the South. 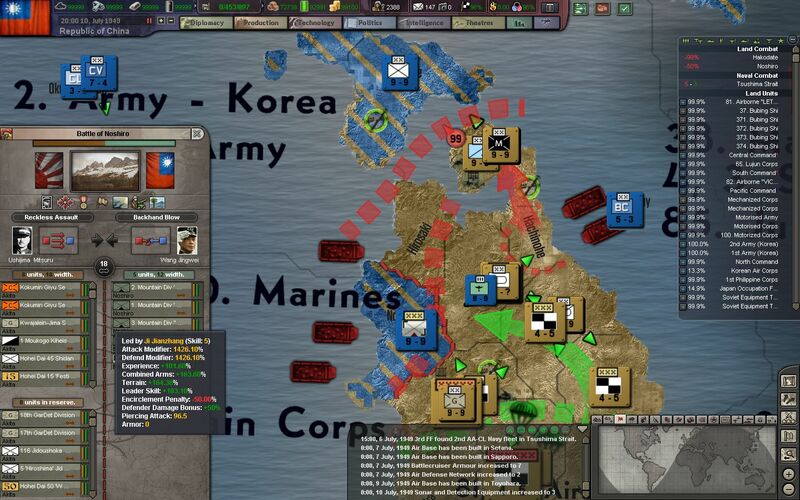 Every week more and more divisions are sent to reinforce the position. The 2nd assault on Akita clears out the city from the Home Guard. 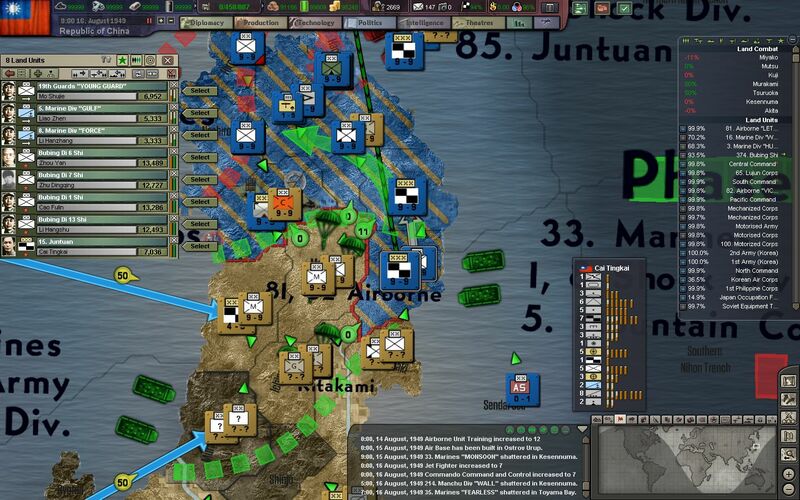 Our quick motorized and combined arms assault manages to capture the port of Akita completely intact, and supplies are quickly shipped in from the mainland. Some of the initial assaulting troops, like the 6. 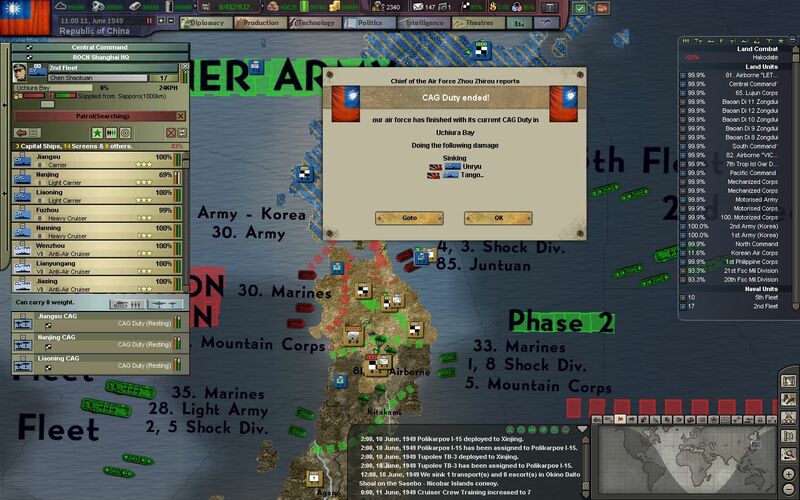 Mountain Corps, have had to subsist on captured Japanese supplies, and occasional airdrops for nearly a month now. 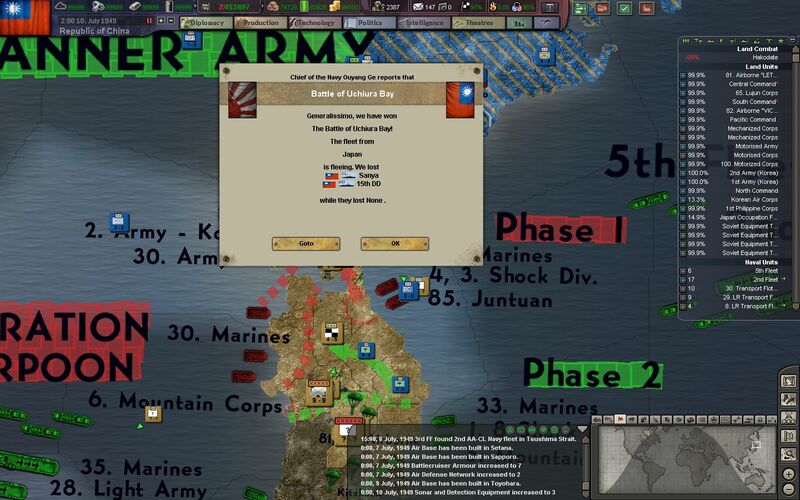 The capture of the port at Akita will also allow us to ship and sustain more reinforcements on Honshu. The 15. 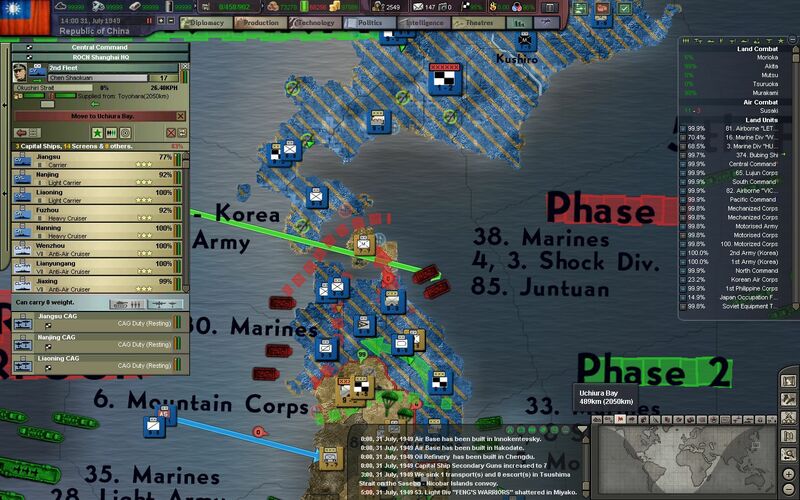 Juntuan Corps is landed at Kesennuma to hold the line, while our battered marine divisions are allowed to retreat north. 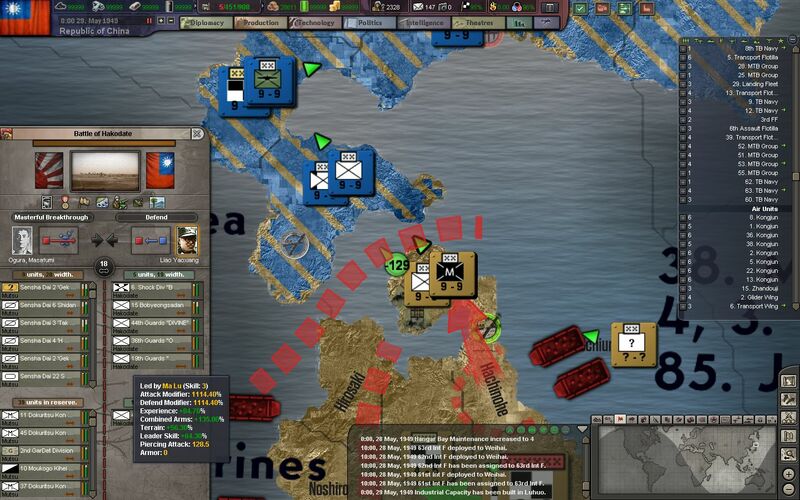 The assault on the port of Mutsu, which is now firmly behind our lines, has after a month progressed well. 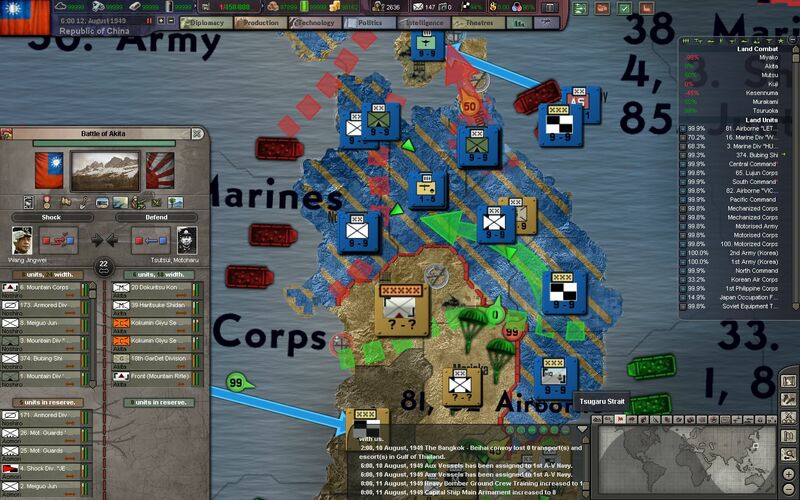 Most of the regular infantry units defending the city have been annihilated, and now just 150,000 men of the Home Guard are left to fend off our marines and shock divisions. The NRA finally decides to abandon the untenable position at Kesennuma, which has completely chewed up troops from both sides. 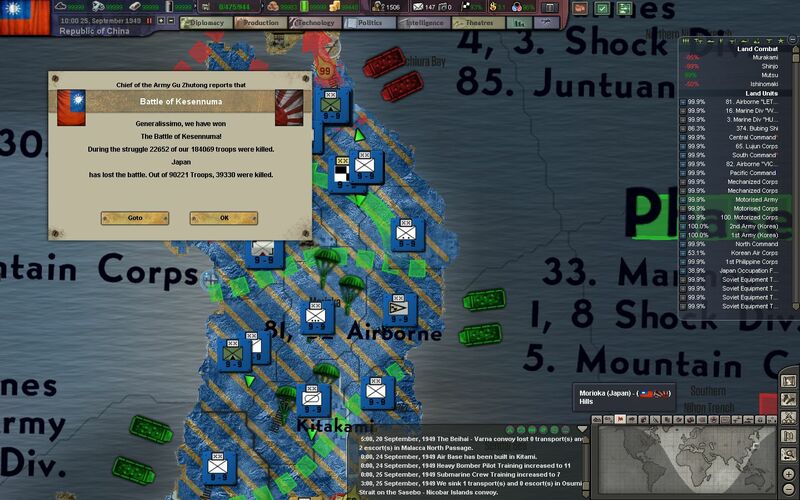 The sacrifice of our soldiers at Kesennuma is not for naught, however. This attritious battle has prevented reinforcements from reaching further north, and was crucial for our mountain troops to capture the city and port of Akita. A massive tank battle erupts in the mountain passes of Tsuruoka, on the western coast of northern Honshu. 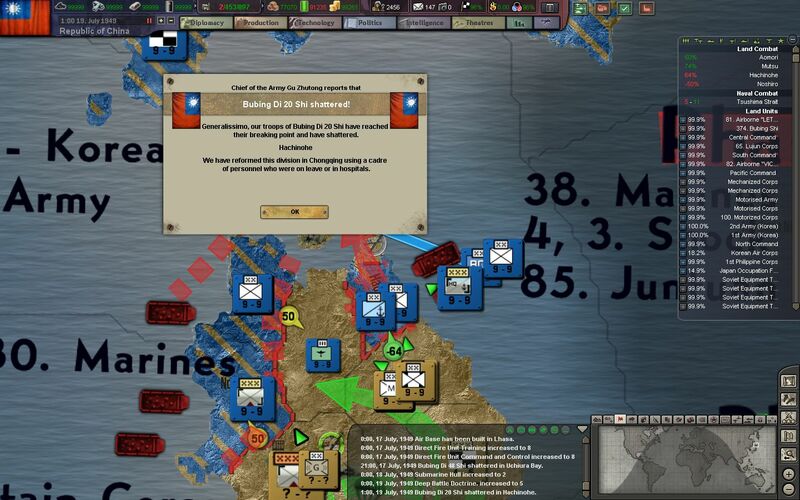 An entire armored army of the IJA meets the 170. 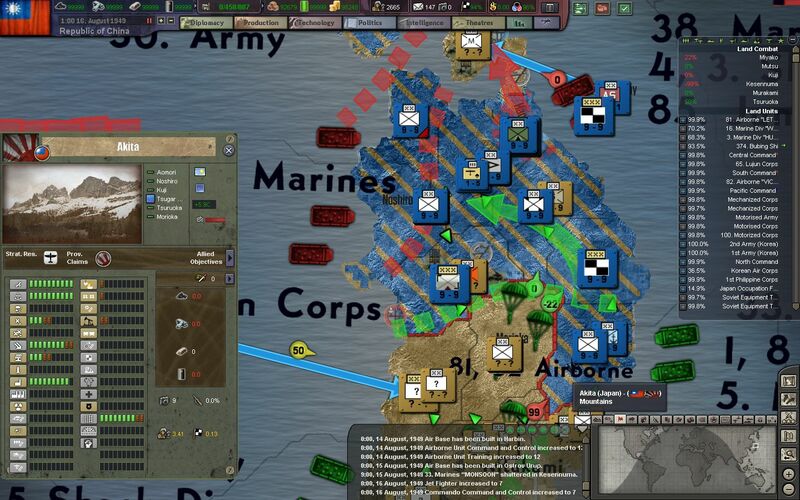 Armored division in the valleys and passes. 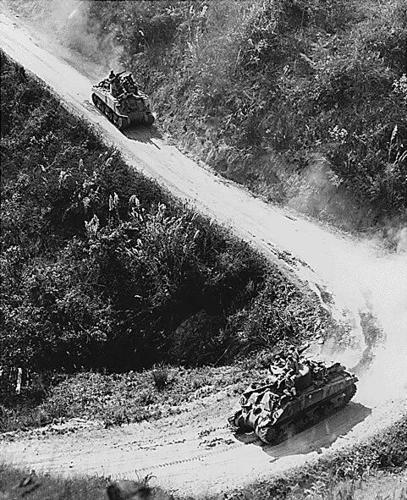 Tank battalions blast away at each other for control of these mountain roads, as our infantry attempts to go up and around the Japanese armor. 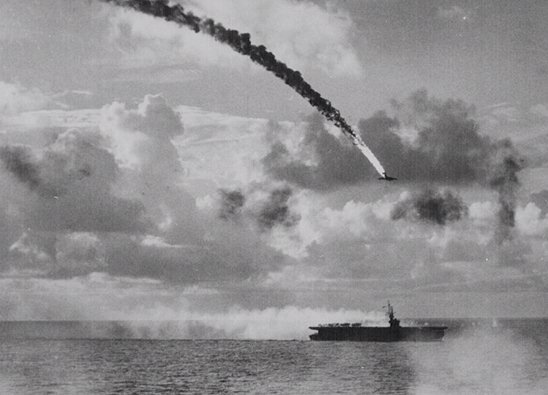 The 2nd Fleet suffers the loss of the light carrier Nanjing, after a massive Kamikaze attack from the airbase at Mutsu. It is then sent back to the port of Sapporo for more repairs. 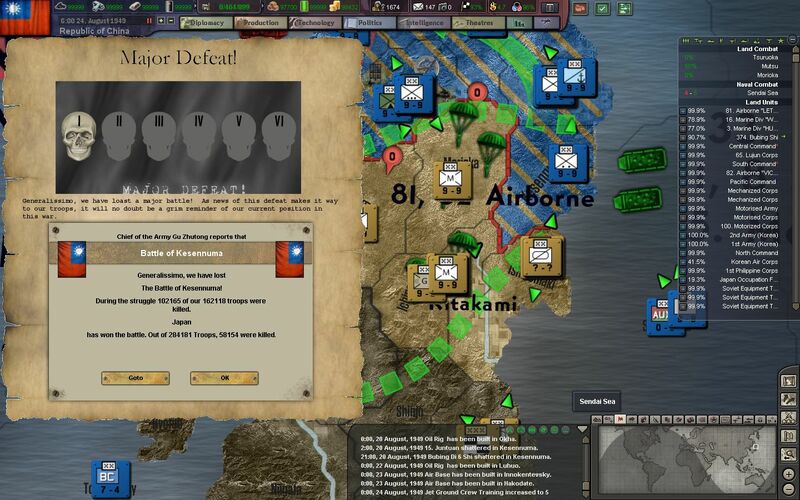 The massive tank battle at Tsuruoka ends in a draw, as both sides retreat back to their original positions. 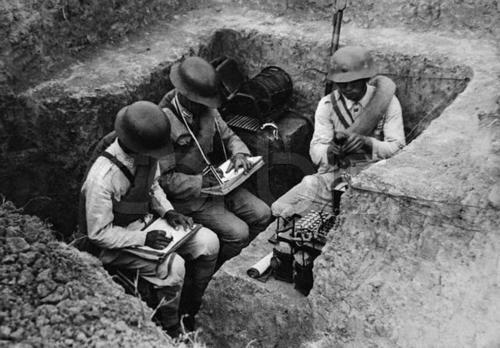 Our usual tactics of using armored and motorized divisions to punch a hole through the Japanese line will not work in this narrow and mountainous terrain. This will be up to our jäegers and mountain troops - to secure passes for our vehicles and regular infantry divisions. It seems as if the IJA has retreated back across the Agano River, as the tank army based at Murakami is nowhere to be seen. 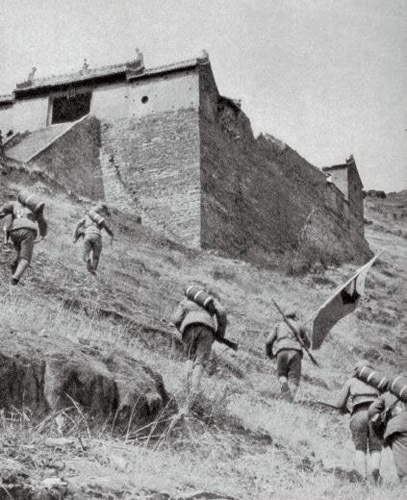 Our advance troops move on the Japanese conscripts who have been left to die in these mountain passes. 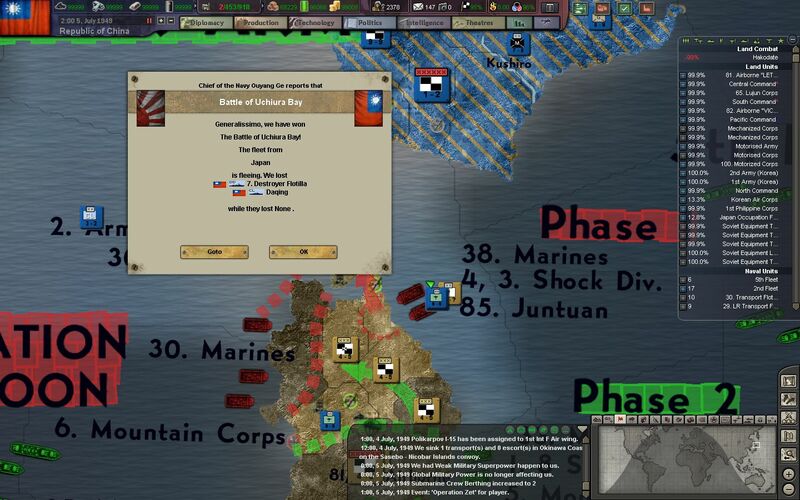 The defenders at Mutsu have now been reduced to just around 100,000 men, and the milita holding the mountain passes on the outskirts of the city are being wiped up fast by our mountain divisions. 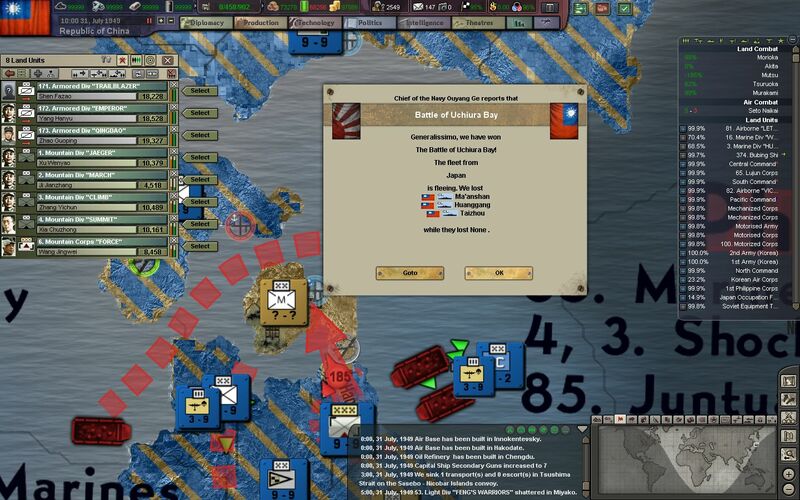 Another disaster strikes the ROCN, as more brazen attacks from IJN battleships, combined with an endless swarm of kamikaze planes, sinks the light carrier Liaoning, as well as 2 cruisers and a score of destroyers. These kamikaze pilots are mostly shot down by our anti-air guns and interceptors, but those that make contact with our ships do terrible damage to them. 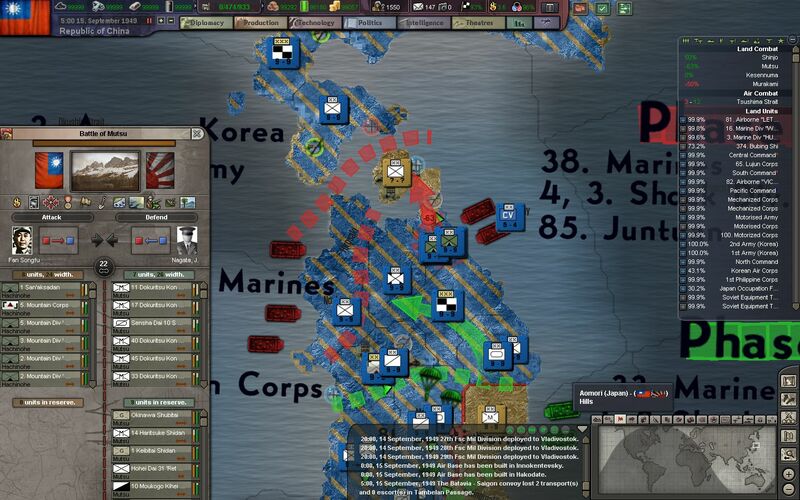 A concentrated push from the Koreans is able to take back Kesennuma, but at great cost. With most of the IJA now well south of this position, we should be able to hold it without much trouble now. 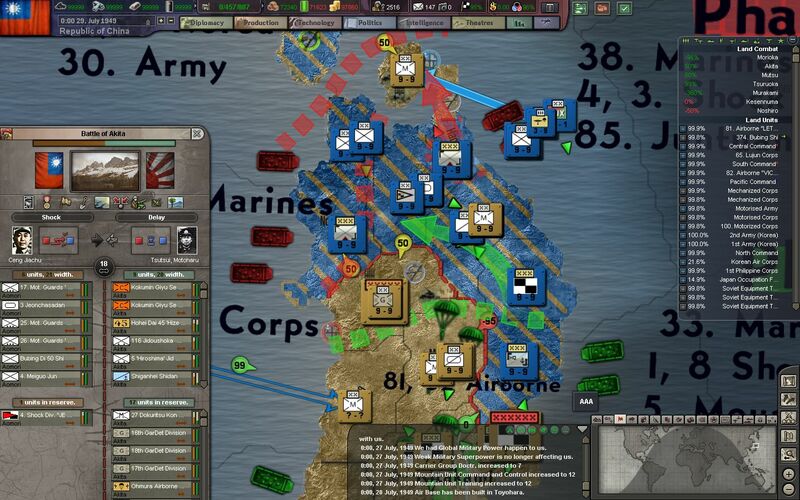 Our new defensive lined - achieved by the end of Phase 2 of Operation Harpoon - is holding well. 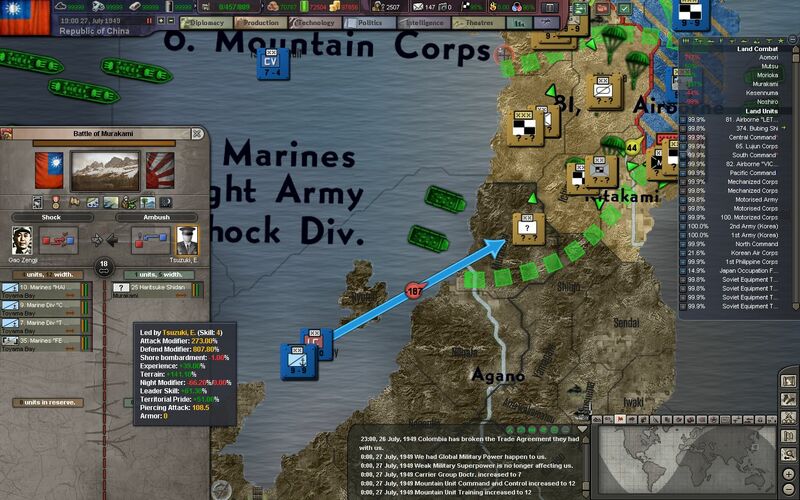 IJA forces attempting to force their way North at Shinjo are forced back with extremely heavy casualties. Mutsu finally falls to the NRA after nearly 3 months of heavy fighting around the area. 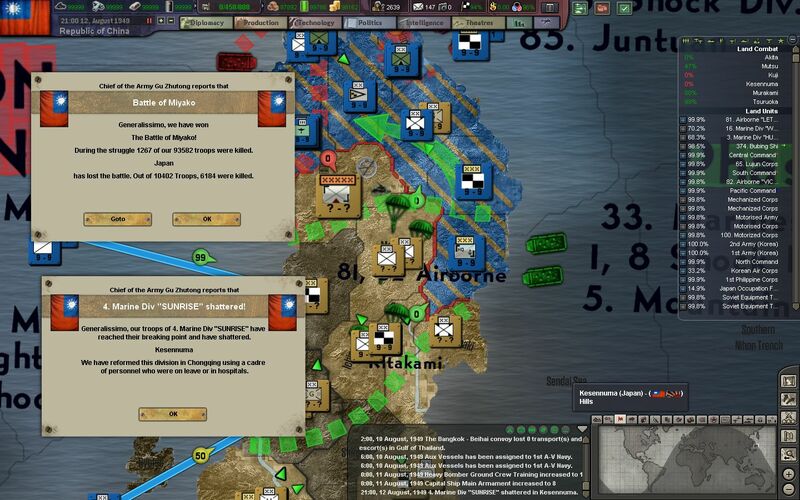 200,000 men of the IJA perished in their breakout attempts at Hachinole and Hakodate, while another 300,000 remained around the city, and nearly fought to the death. 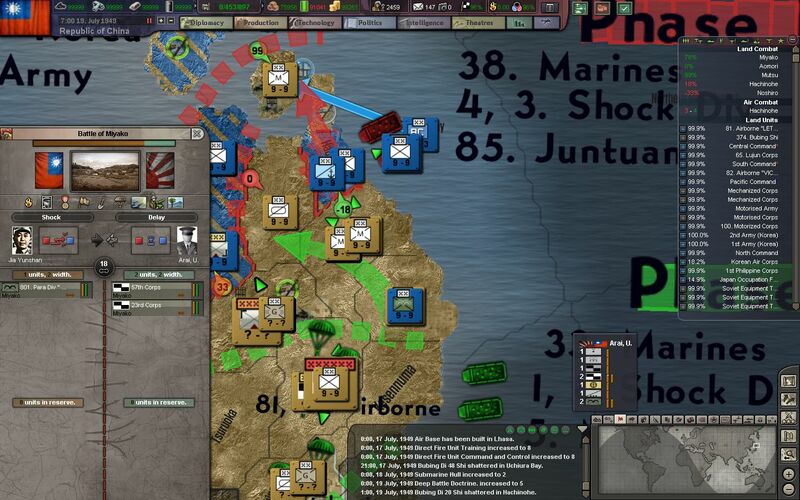 The regular IJA units ended their defense in a manner now all to ordinary to our troops - either by a banzai charge or just mass suicide. Luckily, the Home Guard does not possess that sort of zeal, and surrenders without any more bloodshed.